The event marks the start of the flying season for many people and is the largest gathering of Maritime pilots during the year. With over nine different potential flying sites and friendly competitions, it is a social highlight for many pilots. Pilots enjoying the bountiful air of the 2012 Festival of Flight at Fox River. 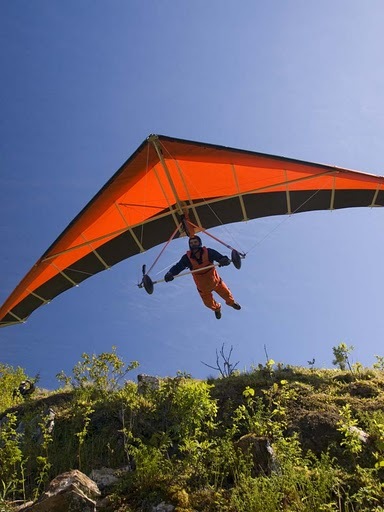 Flying (Friday – Monday) locations depend upon wind and weather conditions. Location updates will be posted on white board in front of BlackRock Bistro (Main Street) and on Twitter @HPAAC – and see site map above. 7:30 (ish) dinner – Pizza and Movie night at Diligent River Hall. Often the best flying of the Festival to be had by those who stick it out. 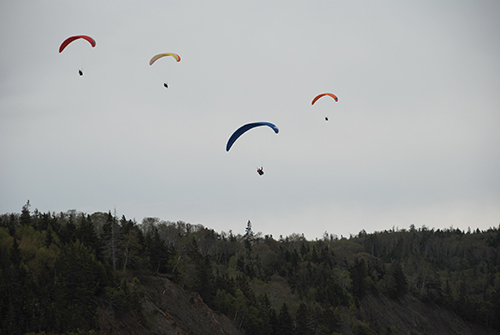 Hang Glider at High Head, Nova Scotia. Pilots from across Canada looking to visit the East should consider making the journey to Nova Scotia for this premier event. With several days of potential flying and a lobster boil on the beach overlooking the scenic Bay of Fundy, this is a very special event. 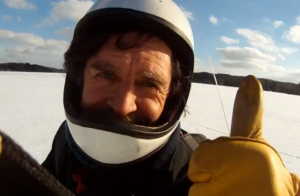 Christopher Ball has recently achieved his dreams… of flying his hang glider at Church Lake Nova Scotia. 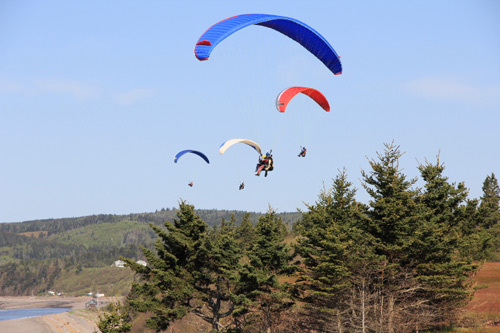 Pegasus Paragliding, the foundation school for the sport in Atlantic Canada, now owned by Patric Stettler, will not be offering instruction for the upcoming season and the foreseeable future. 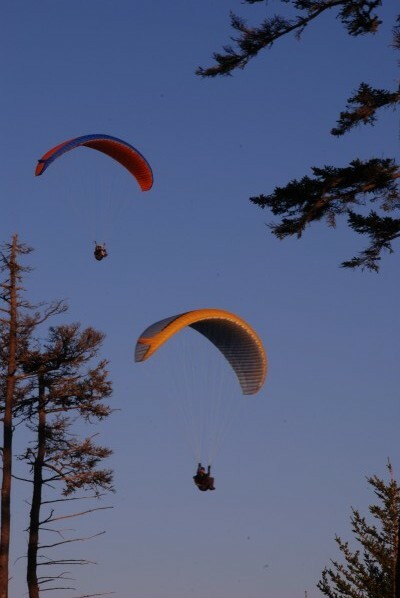 At this time it is uncertain when Pegasus will resume its service to those desiring to enter the world of paragliding. For those who are currently in the sport and who wish to progress in the sport via upgrading of their HPAC rating, they can still do so.Senior Instructor and (President of HPAAC) Michael Fuller will ensure that this service to the community is fulfilled. He can be contacted via personal contact or by using the Contact Us form on this website. Atlantic Canada has the best coastal soaring sites in eastern North America. This year’s Festival of Flight occurred May 17-20, 2013 – and it was one of the best! Although the temperatures were unseasonably cold, that did not prevent twenty pilots from Nova Scotia, New Brunswick, Prince Edward Island and Ontario, from gathering to share stories, laughs and the sky. The social events started the Festival, with dinner at the Glooscap Restaurant, followed by a special screening of The Boy Who Flies, a film by Benjamin Jordan. Thank you to Rod and Helen at the Hall – for hosting the film event. Saturday was a complete blow out, with rain and strong gusty north winds that kept everyone’s feet on the ground. That didn’t slow anyone down though. Pilots used the opportunity for completing reserve repacks, something that should be done annually. Thanks to the Fundy Geological Museum for providing space for us to lay our our wings and complete the repacks. Pilots then gathered at the Pegasus ground handling field for a little bit of fun with kites – feet still firmly on the ground. 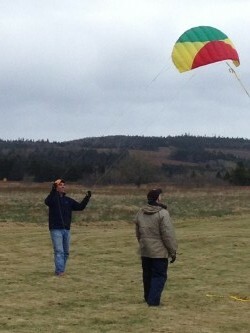 Scott launches a smaller kite while Ted looks on. 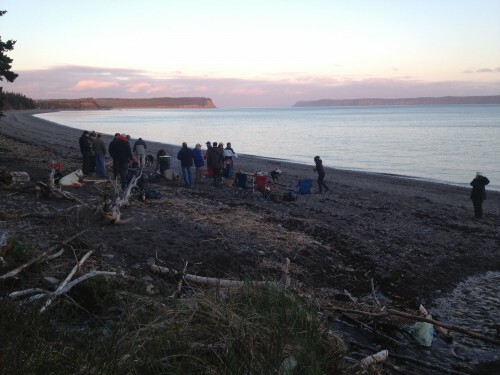 The social highlight of the Festival is the lobster dinner for pilots, a large beach fire on the shore of the Bay of Fundy makes for a very special time. Many laughs and story telling, and fresh Fundy lobster eaten on the beach. The view is not too shabby either. Sunday made up for the absence of flying on Saturday. With light northwest winds in the morning, pilots journeyed to “High Head” at Wentworth first thing in the morning. The air turned out to be excellent – and provided a total of 16 flights. Patric Stettler showed us how it’s done at High Head. 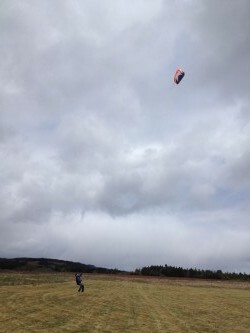 Rob Bird takes to the air at High Head with his hang glider. After a successful day at High Head – the fun wasn’t over yet. Hearing that Scott and Brian were in the air at Fox River, everyone packed up and headed to Fox River for a sunset coastal soaring flight. Nine pilots were in the air at one time – and the scene of colorful wings and the stunning sunset made a special end to a great day of flying. Scott Newman and Chris Jette soar above the coastal cliffs at Fox River. 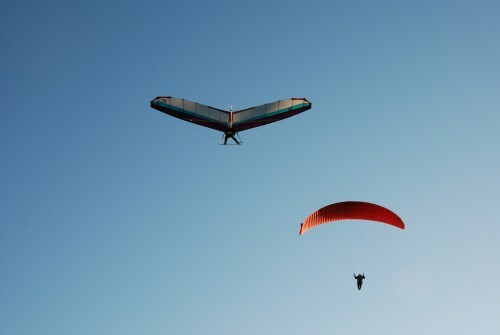 Tim Parker (orange) and Tim Fedak soar the coast during the sunset flight at Fox River. The icing on the cake was the excellent flying that happened at West Bay on Monday morning. Eight paragliding pilots were in the air and soared high above the cliffs at West Bay. The sight was spectacular to see, and left everyone feeling that this may have been the best (and coldest) Festival of Flight yet. Paragliders soaring above the cliffs at West Bay. 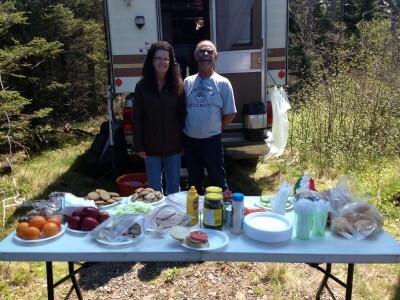 A very special thanks to George and Deanne for their work putting the lunches together again this year. Great sandwiches, fresh coffee, and tasty treats – add so much to this event. Your efforts were greatly appreciated by all. And last but not least, thank you to Michael Fuller and to Patric Stettler (Pegasus Paragliding), for all of the work done in organizing this year’s event. 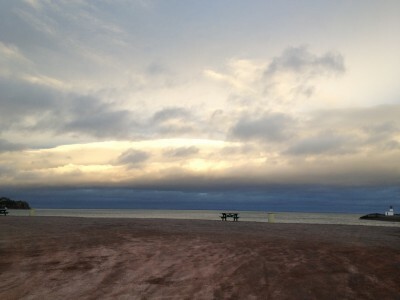 2012 has been an active year for site development and maintenance in Atlantic Canada. There was the work done to improve the launch at Dennis Beach, and the very scenic launch at Greenhill was also cleared by members of HPAAC. Below is an animated gif that shows the progress of clearing the overgrowth in front of the launch, showing it in June, July, and November. Thanks to George, Gabe, Tim P. and others who did the great work at Greenhill. As Chairman of this organization one of the joys and pay offs for being in the position is when I can bring you great news of the work done by your executive to help advance our small world of free flight here in Atlantic Canada. So I am very pleased to announce that your Executive has worked to reconstruct the website, giving it a fresh new look. The website includes business and financial information along with project development details and other links. To complement the new look of the website we have also collaborated in the revamping of our logo. It was a good creative process. So we hope you enjoy and find our work useful. Note: Please Contact the webmaster or leave comments on a page or topic if you see something that needs updating.